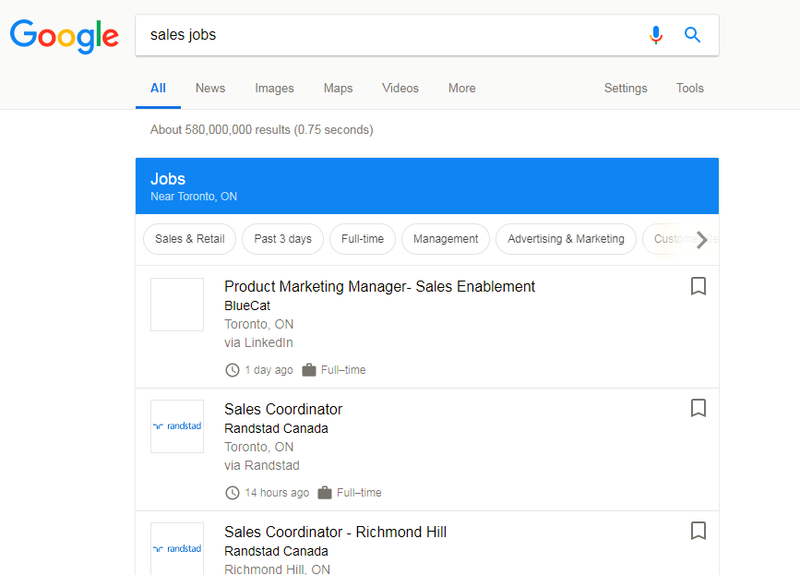 Google has launched a job search feature to help users find job postings without having to leave the search engine. This function has the potential to be much more effective than using a specific website to find jobs, in that it scans for the job title throughout the internet, rather than being limited by known sources. You might even discover new, unknown sources of jobs in your field. The best part of the function is how simple it is: just use the usual google search bar, by entering a job title and the word “job”. Open your Google search page and enter the job title in the search. You can specify a location (e.g. “Toronto”) and/or a level (e.g. “entry level”). If you don’t specify location, it will search near your current location, within a range that you can specify. Google will searches multiple career sites such as Monster, ZipRecruiter, LinkedIn and Glassdoor, as well as agency sites and others. Click on the blue box to open a full page and view the search results, and sort through all the jobs. Options are available to narrow the jobs by Title, Location, Date posted, Type (e.g. full time or contract), Company type (i.e. industry) and Employer. Next to the job title there is an option to save a job for future reference, and return to it at a later date. You will be able to do so only if you have a Google account and are logged into it. If you find that the search results are useful, you can get set up an alert system to email you whenever jobs are posted that match your criteria. (Google Alerts are useful for any topic – you may use them to be alerted whenever their own name or a subject of interest is mentioned anywhere on the internet). Alerts can be edited or cancelled as needed. Google will direct you to sites where the job posted and you can take it from there, as you would usually when you find a job online. I just want to add a little something here. I would suggest that people that are looking for the most up to date jobs, to keep going to their favorite job posting website. Disclaimer: I work at Jobillico, so I am biased. But the thing is, as much as I love Google ‘s job search engine, most businesses will not be able to update their sitemaps and send their jobs live on Google’s job search engine unless they work with a third-party site. So basically, some Jobs can be posted on Google only after 2,3 or even 10 days. I am confident that Google will catch up very fast, but for the moment, I personally find that there is a small user experience gap when looking for a job. However, it really is a great tool to discover new job opportunities, the easiest way possible. Thank you, Jean-Christophe. Good point. I think I saw somewhere on the Google announcement that they are working on closing that gap –it’s always the challenge facing job aggregators. Job seekers find it very frustrating when they click on a posting and it is no longer available.